Attending an event and looking for ways to maximize the experience both online and offline? 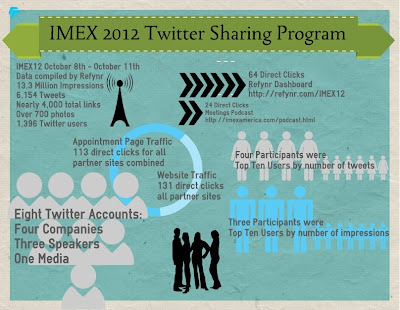 Building Blocks Social Media created a tweet-sharing program for IMEX America 2012 that resulted in more online exposure for all of the brands involved. Most people are not using Twitter on a daily basis, but they see the value in using it at a large event to see who is there, see what people are talking about and participate in the conversations themselves. Are you leveraging this opportunity in the right way? From September 17th through October 11th, 261 tweets were created for 8 different twitter accounts. Most of this content was also shared via personal Facebook profiles, company Facebook pages, personal LinkedIn profiles, company LinkedIn pages, personal Google+ profiles, and company Google+ pages, but the focus was on Twitter and the hashtag: #IMEX12 because that is where the greatest opportunity for reach existed. Leading up to an event, the official hashtag will get increasingly more traffic as the event nears and our twitter content schedule reflected that increase as well. The partners involved in this program were not only exhibitors, but speakers as well. Anyone who attends a conference typically has an interest in maximizing the networking potential from that event. Do you typically just show up and hope for the best or do you go in with a strategy? Before the event (specifically an appointment based show), exhibitors need traffic directed to their websites, blog posts and appointment pages so buyers sign up to see them before other vendors. At a traditional trade show, an exhibitor wants to drive traffic to their booth. Speakers want attendees to show up at their sessions (especially if they are competing with other speakers during the same time slot). HootSuite was used to pre-schedule the content (on Twitter and other platforms) so the partners did not have to actively tweet during the show. The ones that added tweets and re-tweets during the show did see higher traffic. Three of this program’s participants were in the top ten users, by impressions. Four of this program’s participants were in the top ten users, by number of tweets. · The direct link to the official podcast page was shared on Twitter 61 times. · 24 additional clicks came from this program through the ow.ly link. The content took awhile to curate by combing through the event website. General Sessions and other events that most people would attend provided good content to share. Specific sessions that related to the partner’s product, service or interests were strategically selected for appropriate sharing. The bulk of the content was focused on the partners directing traffic to the other partners’ appointment pages, websites, sessions and trade show booths. Social media is less effective if you only talk about yourself, so the purpose of this program was to share good information about the conference and other attendees. The partners received the benefit of other people sharing information about them. Some partners scheduled content on their own and some asked Building Blocks Social Media to do it for them. Bulk scheduling was a bit more difficult than expected because we were sharing documents across operating platforms and each partner had a different familiarity level with programs like HootSuite. A lot of troubleshooting and communication was necessary during these phases of the project. The traffic generated from this project was higher than any individual person or company would have been able to create on their own. With the right mix of partners and a dedicated strategist to create the content and put it together, I would recommend a program like this for any large event or trade show in your future. "If you are only awesome to influencers, you are not awesome." I had the pleasure of seeing Scott Stratten speak again at a LinkedOC event this week. My new friend, Sarah Beth Rosa was there and put together a great post on the evening. Instead of repeating everything she said, I'm just going to add a couple of my favorite tweet-able moments and ask you to click over to her site. "You can automate your social media - just like you can automate a wake-up call... and lose your chance to be awesome." "Three years ago, the people who were on Twitter were there because they wanted to be there. Now, people are there because they think they have to be there." ...Agencies should not be doing your social media if they can't answer customer service questions. "Outrage doesn't take the weekend off." How to Schedule posts on Twitter, Facebook and LinkedIn. Video created for the MPISCC ROC your ROI EdCon committee. Do you know what people see about you online? The statistics are constantly changing about which demographics are growing on which social networks, so I won’t even bother looking it up now to publish for this article – because it will change tomorrow! What doesn’t change, and what is harder to measure, is the possibility of personality having more to do with social network adoption than age. One session I attended talked about generation Y using social media for personal gain and generation X using it for professional gain. As a general rule, I think this is true. Baby boomers signed up for Facebook initially to keep tabs on their kids and so their original motivation was personal use. Many of them struggle with the idea of using Facebook for professional networking. I would say that if you are “friends” with people in your industry and truly have relationships with them, why would they be any different from friends outside of work? It will be interesting to test out Google+ Circles to see if this solves this dilemma for them. Most baby boomers are not interested in Twitter because they have not seen a strong enough reason for them to explore it. Until you feel like you are missing out on something, you are going to keep your distance. These are the stereotypes that are easy to make. However, if you do some research about your stakeholders and which social networks they are using, you might be surprised. The reason we attend industry association conferences is to learn best practices so we can make our own events better. Are you paying attention to how your peers are using social media at these events? Your attendees will not necessarily use social media in the same way your peers do at our industry association conferences. However, it might be worth noting how the community has evolved. Now that I have attended two of the major association conferences in our industry, I can compare and contrast the communities. The first thing worth pointing out is that the most influential tweeters can be found at both events. They typically attend more than one professional development conference on a national or international level. This might seem obvious because if they are successful networkers offline, then they are probably successful networkers online. Is the same true of your constituents? Our industry is also lucky enough to have a “non-partisan” hashtag on Twitter. This means that there is a place for us to have conversations on Twitter that is not tied to one of the industry associations. This has connected the people who only attend events sponsored by one association, or are not able to attend any of these professional development conferences. Are you paying attention to the hashtags that your constituents are using or are your organization’s hashtag the one they go to? Over the past four years, there certainly has been a migration of people on and off Twitter in our industry. The use of “non-partisan” hashtags as well as industry association hashtags has an ebb and flow to it. The early adopters got the party started, but like any other trend, once it was not the newest thing anymore, they started slowing down the participation. Other folks figured it out in the mean time and if they were able to see a positive ROI for the time spent there, they continued to participate. Your constituents may be found at any point in this continuum. Are you monitoring their activity so you can make informed decisions about what your event should be providing? At an event last night held by the San Diego AdClub (which had some amazing speakers, by the way), I was having a great conversation with someone about how I use different social networks. I mentioned that LinkedIn's Status Update feature wasn't as useful as it was before they integrated twitter into the feed. Once they gave people the opportunity to post everything to LinkedIn that they tweeted, it became harder to find good content about people I was connected to. This morning, I received an e-mail from LinkedIn letting me know they have made some changes to their integration with twitter. It seems that you can still post a status update in LinkedIn and send it to your twitter feed. You can also post a tweet on twitter - and as long as you include the #in hashtag in your tweet, it will also show up in your LinkedIn status update. This means that you are consciously choosing to post that update on both platforms, regardless of the method you use, instead of just defaulting to send a post to both without thinking about it. The third way this will continue to happen is posts that are coming from a platform like HootSuite. However, with these types of platforms, a person does have to specify which networks they are sending each message to, so it will still be intentional. I have written in the past about sticking to a strategy for each of the platforms you participate in. Now that LinkedIn will not be as cluttered with tweets, my original strategy for LinkedIn engagement should work again. LinkedIn is your professional network / resume. You should update your status on LinkedIn with current projects you are working on, professional achievements, things you are seeking help with, etc. This will bring back the opportunity for people in your network to connect with you on these items and continue to build relationships. Unfortunately, this means that we will have to start paying attention to the LinkedIn status updates from our network again because it will contain valuable information. While I am on the subject, I will quickly mention that the currency on twitter is links. This is the platform to share links to blogs and articles that you find helpful so that your followers will see what kind of information you are sharing. The currency on Facebook is photos. Share photos from your personal life and from your professional life. It will make you more like-able, and again, continue to build relationships. Google+ doesn't seem to have one particular currency yet because they have tried to integrate all of these things together. We will see if one type of communication emerges as the best strategy for that network. Let me know if you have any questions about the integration between LinkedIn and twitter, or any of the other social networks. Just one year ago, twitter seemed to be an emerging way to connect t.v. viewers together. I seem to remember seeing the twitter feed on the CNN New Year's Eve show with Anderson Cooper and Kathy Griffin. This year, they had a constant rolling feed of tweets, they mentioned it a few times on air and actually answered one or two questions at the end. I was monitoring the actual feed on twitter and they had enough tweets to make the trending topics list. This means that more people were tweeting with their hashtag than almost anything else on twitter last night. Here's where they failed: instead of running the actual twitter feed, they picked out about 5 tweets every 15 minutes and just recycled them. It was an epic missed opportunity! Here you have new tweets coming in by the second - and you recycle the same ones over and over. You know that everyone who was tweeting was doing it because they wanted to see their tweet on t.v. Most of them were positive, too. If CNN had chosen to run all of the tweets except the negative ones, that would have been an improvement. In this day of transparency, however, people expect to see the good, the bad and the ugly. If you have the guts to show 5 tweets out of 100 of people who are being negative, it increases the positive sentiment that your viewers will have. I am guessing most people weren't watching the t.v. and the twitter feed for the entire broadcast because only a few other people tweeted about the recycling of tweets. So, as it turns out, most people didn't notice what I noticed. What if they had run the actual feed? More people would have seen their tweet on air and their sentiment for CNN would have increased. CNN didn't understand that the reason they should have been doing it was not to show a few people talking about how much they were looking forward to seeing Anderson Cooper and Kathy Griffin on t.v., but to make the people tweeting feel important and part of something bigger than themselves. Make your social media strategy about your customer, not about you. Here's an interesting TED talk. MIT researcher Deb Roy starts out talking about how he wired his house with videocameras to catch 90,000 hours of video to understand how his infant son learned language. Then, he translates that experiment into the connection between millions of people watching the same thing on t.v. and having a conversation about it online.